This is very common question from people who wish to come to valley of flowers. 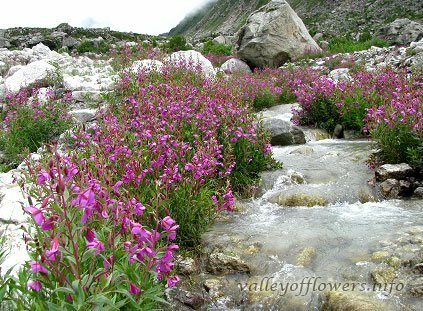 Valley of flowers trek needs one track for four days ex Govindghat. It is not so difficult trek. 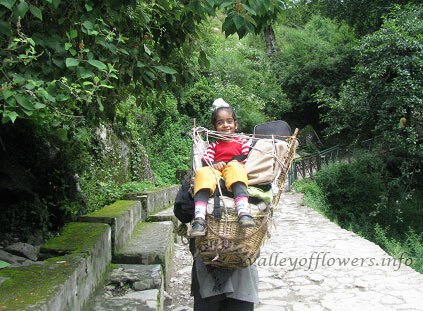 The valley of flowers trek is well-defined and well paved. Although it is steep at many places, but except the day you go for trek to valley itself you can hire pony to reduce the difficulty level of the trek. Valley of flowers trek difficulty level is moderate to easy. Please read our Valley of Flowers trek itinerary page for detailed itinerary of valley of flowers trek. 1. Govindghat to Ghangaria trek : Distance 10 km by trek. Helicopter and ponies are available to skip trekking. Earlier the trek used to began from Govindghat. Govindghat is 25 kilometers before Badrinath. Govindghat is at the height of 5500 feet and Ghangaria is at the height of 10,200 feet. Now you can drive for four kilometers from Govindghat till village Pulna. That is the gain 3700 feet after trekking for 10 km. The trek used to be steep in its first 3 km (now made motor-able) and last 3 kilometers. Today’s trek may be avoided by taking pony or using helicopter. Helicopter service can be used only when weather is clear but the best time to visit Valley of flowers is the monsoon season. So you cannot rely on helicopter on this day. You may or may not get helicopter but you can easily get pony for Ghangaria. For elderly people even palanquins are available. But I have personally seen that many a times elderly people trek whereas some of the young people in young 30s take ponies. Ghangaria to valley of flowers is not so steep trek as once you reach to the official starting point of the valley of flowers it almost at the same level for the next 3-4 kilometers. The official starting point of the Valley is almost 3.5 km from Ghangaria and in my opinion out of this 50% is steep uphill and the remaining is not so steep. This day ponies are not available as they are not allowed to enter in the valley. But Palanquins and Doli’s are available. But you need to buy the entry tickets for the porters as well. Their help can be taken up to the first three kilometers and after that you can trek as it is almost flat. But I recommend you to trek only or you will miss out lot of flowers on the way while in to Doli or Palanquin. 3. 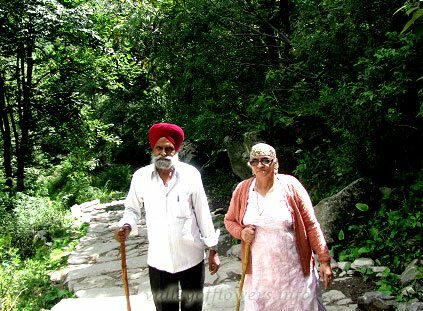 Ghangaria to Hemkund Sahib: Distance 6.5 km one side, porters and ponies are available. Ghangaria to Govindghat : Ponies and Helicopter available. It is purely downhill as opposed to explained in Para 1 but if you want to save time you can use pony or Helicopter. Difficulty level of valley of flowers trek is moderate. 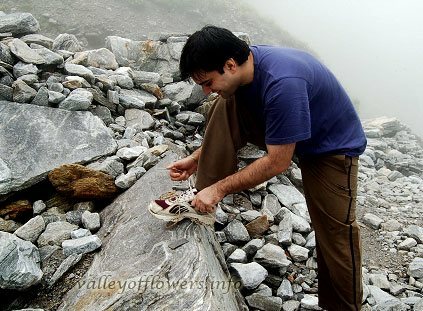 We want to go valley of flowers trek but try to avoid raining. which time should be prefer for us. Hello I would like to travel to the valley of flowers in early June 2019. Are there availabilities at this time? Please send me the itinerarys, cost and what to bring. Relevant itinerary has been sent to you. Please visit our Best time to visit valley of flowers, Things to carry for Valley of flowers trek pages for more information.